The Pantanaw Karen Youth (PKY) is carrying out a mat weaving project to increase the income of rural women in Pantanaw Township, Ayeyarwady Region with funding from an international non-governmental organization (INGO). Myanmar has received its first foreign investments in the power supply sector in the transitional six-month fiscal period, which started on April 1, according to the Directorate of Investment and Company Administration (DICA). Myanmar on Sunday signed a memorandum of understanding (MoU) with China agreeing to establish the China-Myanmar Economic Corridor (CMEC), part of Beijing’s Belt and Road Initiative, according to a statement from the China National Development and Reform Commission. A huge petrochemical facility is up in Kyaukphyu, in Rakhine State in Myanmar. The conference will take place under the theme “Ensure WASH: A Global Agenda to Improve Quality of Life. 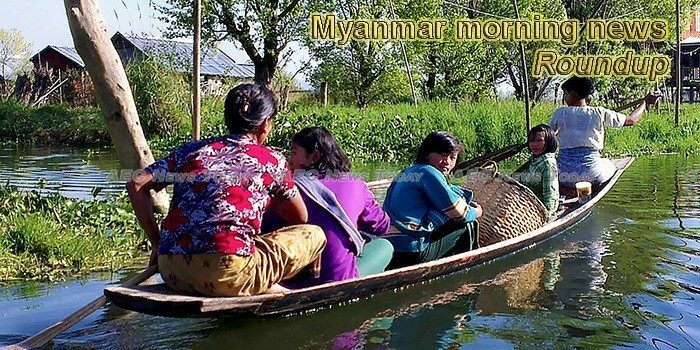 The conference’s website www.myanmarhrc.com has been launched for both local and foreign medical researchers to be able to know details about the conference, make registrations to attend the conference and get necessary documents about the conference. Central Executive Committee Member Nann Htwe Hmon of the Shan Nationalities League for Democracy (SNLD) presented the party’s policy, stance and work program on radio and television on 12 September. The cabinet has given a green light to the Mass Rapid Transit Authority’s (MRTA) two light rail transit or tramway routes, one in the northern province of Chiang Mai and the other in the southern provinces of Phang Nga and Phuket. Airports Council International (ACI) confirmed the Yangon International Airport (YIA) is in line with international safety standards, sources said. The NGO Free Expression Myanmar (FEM) has expressed concern about a newly adopted Broadcasting Law Amendment (2018) that contains only superficial change, fails to protect freedom of expression, and reflects the government’s lack of open consultation. The panellists had gathered to discuss whether senior generals in Myanmar should face international justice for what a recent UN fact-finding report called genocide committed by their security forces against the Rohingya and other minorities. During the 18th meeting of the Union-level Joint Monitoring Committee (JMC-U) held at the National Reconciliation and Peace Centre (NRPC) in Yangon yesterday, JMC-U Chairman Lt-Gen Yar Pyae called for all sides to avoid area settlement and amassing military power so that armed conflicts can be circumvented while everyone is working to build trust among each other. Yangon donut lovers got their first taste of Krispy Kreme donuts this afternoon at a press briefing ahead of the company’s grand Myanmar opening on Sunday. The Human Rights Council this morning held a high-level panel on the seventieth anniversary on the Convention on the Prevention and Punishment of the Crime of Genocide. Thailand and Myanmar are the only two Asean countries to have appeared in the report.